Izakaya in Japan denotes small taverns where patrons can eat, drink and be merry ... without burning that big a hole in their pockets. 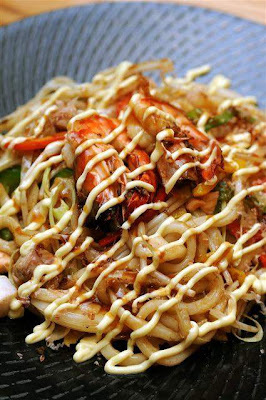 It's also the latest Japanese dining trend to catch on in KL lately as more outlets are jumping onto the izakaya bandwagon with their own variety of small dishes not unlike the Spanish-style tapas. 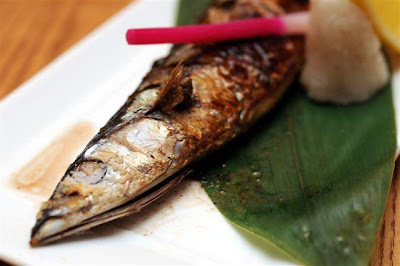 ENJU at Prince Hotel & Residence KL has also caught on with the launch of its latest Izakaya A La Carte Menu. 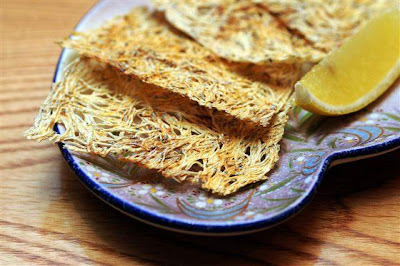 One of the most popular offerings include TATAMI IWASHIwhich refers to the ultra-thin, flat sheets of grilled dried tiny baby sardines that truly resemble the Japanese tatami mat. Slightly crisp with a hint of smokiness, its mildly briny taste makes it a splendid accompaniment with any tipple, be it sake, wine or beer. The SHAKE HONEY NO POTATO SALADA YAKI seems a tad heavy for an appetiser but superbly delectable nevertheless. 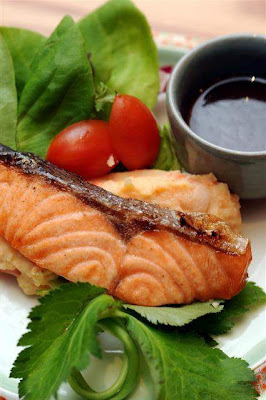 Basted with a honey and ginger sauce before the salmon is grilled, the fish is best eaten hot accompanied by a wasabi and ginger shoyu dip. We love the mashed potato salad that served as its base. 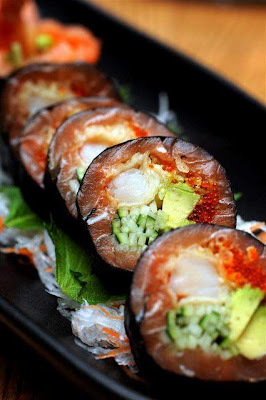 If you're a big sushi fan, don't miss ENJU SIGNATURE RICE ROLL. 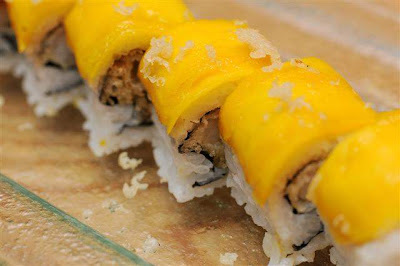 Mango and deep-fried tiger prawn are the key ingredients that hog the limelight in the ROCK & ROLLcreation while the SUNRISE ROLL proffers deep-fried oysters in breadcrumbs encased in sushi rice, dried seaweed and sesame seeds. 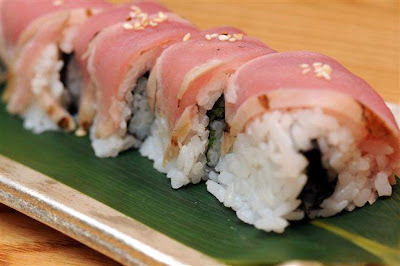 Less rice, more fish makes ENJU DYNAMITE ROLL stand out from the regular repertoire. 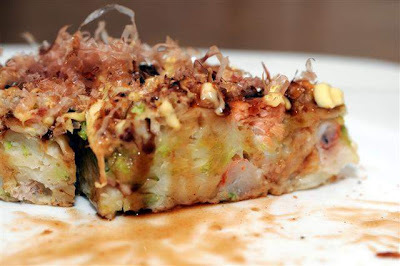 The combination of fresh salmon, cucumber, flying fish roe, tempura flakes, avocado and sushi rice wrapped in nori (laver) is guaranteed to please. My only complaint about the MAGURO TATAKI ROLL is that the fish slices are too thin thus lessening the pan-seared red tuna's impactful presence. 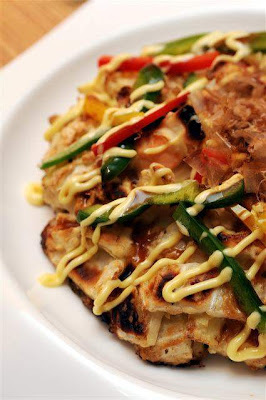 OKONOMIYAKI - a Japanese pizza of sorts is thicker at ENJU than those you'd find elsewhere so it is best to go easy on this. 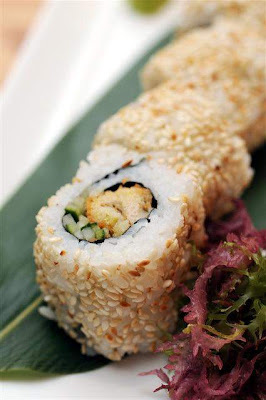 Embedded within its bread-like texture are chopped crabmeat, octopus, prawns, scallops and vegetables. Additional flavours come from the topping of bonito flakes, seaweed strips, tonkatsu (Japanese-style Worchestershire) sauce and mayonnaise. 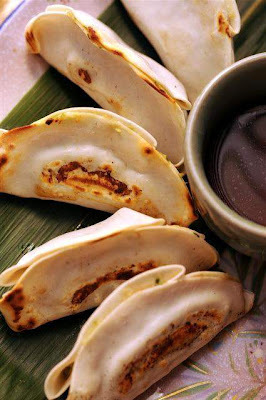 GYOZA - the Japanese equivalent to Chinese pot-sticker (wor tip) is another utterly scrumptious option. Freshly made from scratch, the dumplings boast a filling of minced chicken, cabbage, chives and water chestnuts. I always enjoy the Japanese 'back to basics' way of grilling fish ... the SANMA or Pacific Saury was the freshest ever with its inherent flavour clearly untarnished, its texture superbly refined. 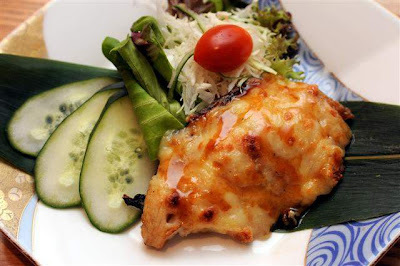 The GRILLED COD is indulgently rich but sweet and silky smooth to the last bite. 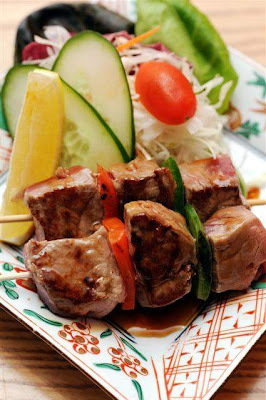 Another notable niblle to complement your favourite tipple is GRILLED BEEF ON SKEWERS. Its well-marbled, butter-tender texture was simply sublime. I didn't fancy the dessert though probably because the sourish accent really threw me off guard. 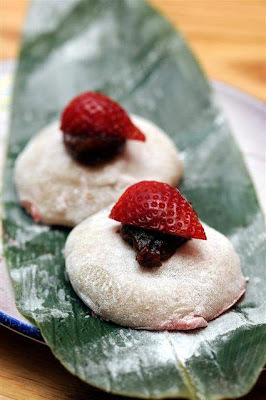 It wasn't the sweet ending I was hoping for - a shame really as the chef has gone to extra lengths using fresh strawberries to make the mochi filling.